Other functions are available in TVPaint Animation to help you in managing your storyboard. This button allow you to change the size of your thumbnails. Its use is really simple : you only have to maintain a left click on it and move to right or left with your mouse to enlarge or reduce the thumbnails. This button is used to modify the “Timecode” display, either in images or in seconds. Double click in the Untitled zone of your clip or right click on the visualization area of a the thumbnail and select Rename Clip. Clips can be brought together into the same group, as layers too. To assign a group to your clip, right click on the visualization area of the thumbnail and select Group. Features of clips' groups are the same as groups available in the Timeline or in the sound management. Please read lesson 04 to know more about how to manage groups. You can even assign a color to several clips to select them with [Shift]. Sometimes, a scene can be deleted from a movie, or can have several versions. In such cases, it could be bad to delete all your work. It is better to hide this scene and keep it safe, "just in case". To hide a clip, right click in the visualization area of your clip and select Hide clip, or left click on the right corner, at the top of your clip. Maintain a left click on the clip's name and move it where you want. If you select and move a clip contained in a scene, the clip will turn into a new scene containing one clip. If you move it from a scene to another scene, it will adapt consequently. Basically, the first storyboard's view mode is the Thumbnail mode ( ). Three other view modes are available to optimize the making of a storyboard. The Column view ( ) or the Row view ( ) are the most used views, traditionally. 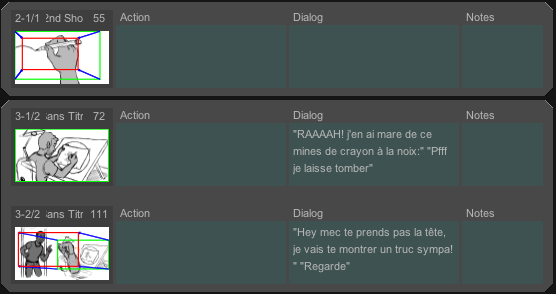 Both of these modes allows you to add informations such as action, dialogs and notes. You can even copy paste a text from a text file. 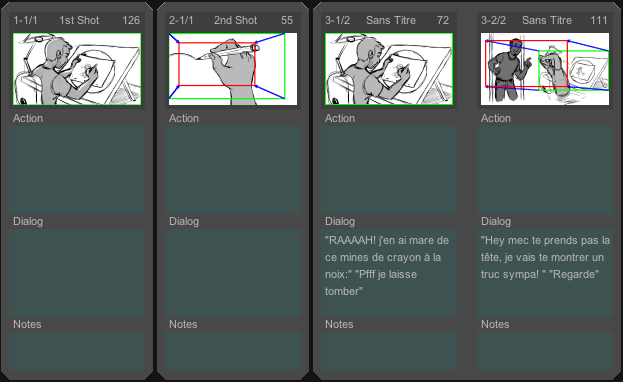 The fourth view, the Timeline view ( ), is used to visualize your storyboard as an animatic.